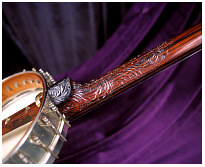 A simple banjo neck can take one hundred hours to complete while a more elaborate neck can take two hundred or more hours to finish. The end result is a handcrafted, personalized, musical work of art that will last for generations. 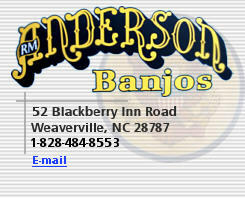 Creating a hand crafted banjo starts with selecting high quality boards for their natural grain beauty. The boards are ripped, book matched and glued together with various veneers into a neck blank. The next step is to cut the basic profile of the neck and install the truss rod for support. The fingerboard and peghead overlay are cut, bound and glued to the neck blank. The inlay and engraving work is done next. The neck is then shaped and the heel is carved. Finally, adjustments are made for the pitch of the neck and a dowel installed before being attached to the pot assembly of the banjo.